Altair is the premier provider of design optimization software, driving design processes of leading manufacturers for over 20 years. Through a complete suite of optimization technologies, HyperWorks provides design guidance spanning ideation, concept design, detailed engineering, and multi-disciplinary and systems optimization. HyperWorks offers optimization technologies for both concept design and design fine-tuning stages of a multi-disciplinary product design cycle. OptiStruct is the award-winning integrated analysis and optimization product that has concept design and design fine-tuning capabilities for structures. HyperStudy is the solver-neutral design exploration, study and optimization product that can be used with third party solvers. "The improvements in packaging performance derived from the simulations during the entire design cycle were very significant. The maximum acceleration levels experienced by the product were reduced by 29 %, and the maximum product strain was decreased by 28 %. The greatest flexibility to impact the design of a product is at the conceptualization phase. To take advantage of this flexibility, methods aimed at driving design concepts should be employed at this stage. In doing so, the potential for better, more efficient designs, lighter and innovative designs is maximized. OptiStruct's design-synthesis technology uses the topology optimization approach to generate innovative concept design proposals. OptiStruct generates an optimal design proposal for the most efficient material layout of the design based on user-defined design space, design targets and manufacturing process parameters. For thin-walled structures, beads or swages are often used to reinforce the structures. For given allowable bead dimensions, OptiStruct's topography optimization technology will generate innovative design proposals with the optimal bead pattern for reinforcement. Free-size optimization is widely applied in finding the optimal thickness distribution in machined metallic structures and identifying the optimal ply shapes in laminate composites. Element thickness per material layer is a design variable in free-size optimization, allowing the generation of optimal thickness distributions that meet the design requirements. Free-size optimization is the concept design phase of OptiStruct’s composite design and optimization process that identifies optimal ply shapes and drop-off zones. Additive manufacturing (AM) is making a big splash in the manufacturing community. The unmatched flexibility offered by 3D printing allows the creation of complex geometries not manufacturable by the other, more traditional approaches such as stamping or casting. This creates a great opportunity in the design community to develop complex, multifunctional designs. With over 20 years of optimization experience with the technology and services, Altair is in a unique position to apply those learnings to additive manufacturing. We see a great symbiosis between topology optimization and additive manufacturing, with both technologies sharing very similar philosophies in their respective domains. To take advantage of the manufacturing flexibility, design approaches need to be revisited. Topology optimization sans the traditional manufacturing constraints (e.g. for cast or stamped parts) allows OptiStruct greater flexibility in generating an even more efficient design with a potentially larger weight savings as well. A more literal interpretation of the topology proposal is possible given the manufacturing flexibility to build complex structures through 3D printing. Unique to 3D printing, is the ability to print lattice structures. Such structures offer many desirable characteristics such as light weight and improved thermal properties. Lattice structures are also highly desirable in the biomedical field for implants due to their porous nature and the ability to facilitate the integration of tissue with the trabecular structure. OptiStruct has a unique solution to design such lattice structures that is based on topology optimization. 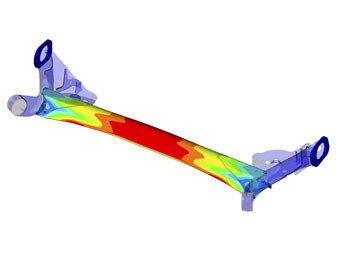 Subsequent to the topology optimization phase, large scale sizing optimization studies can be run on the lattice beams while incorporating detailed performance targets such as stress, buckling, displacement and frequency. Design fine-tuning is used when design changes are limited to changing dimensions (height, length, radii, thicknesses), model parameters (material properties, loads). Parametrization is done depending on the parameter type; i.e. if the parameter is a value in the input deck such as thickness; you can use size optimization; if the parameter does not have a corresponding value but needs modification of the model instead such as radii in a finite element model, you can use shape optimization. HyperWorks offers several options that will improve efficiency while setting these studies while making sure that you achieve the best outcome from them. Shape optimization is used to refine an existing design through the shape variables created using HyperMesh's morphing technology, HyperMorph. 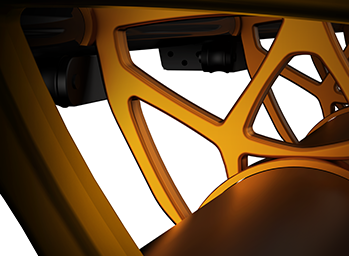 These shapes are then used by OptiStruct or HyperStudy to update and optimize designs, easily proposing design modifications without a need for underlying CAD data. OptiStruct’s proprietary technique automatically generates shape variables and determines optimal shape contours based on design requirements. This in turn relieves users from the task of defining shape variables and allows for greater flexibility for design improvements. Free-shape optimization is very effective in reducing high-stress concentrations. 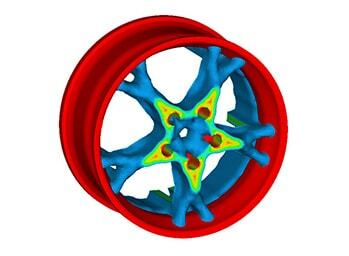 Size optimization finds optimal model parameters such as material properties, cross-section dimensions and thicknesses. Model parameterization for OptiStruct and HyperStudy can be setup easily within the HyperMesh environment. HyperStudy can also parametrize any ASCII input file. OptiStruct’s ply-based modeling approach greatly simplifies modeling composite laminates and enables optimization of ply-bundle thicknesses and ply stacking sequence. Ply bundles are groups of plies of the same shape or layout. By optimizing the bundle thickness, the optimal number of plies per material or fiber orientation can be determined. OptiStruct also considers manufacturing requirements and ply book rules throughout the optimization process to achieve practical designs. Design of engineering applications needs to include several different aspects of the application such as cost, structural performance, durability, manufacturability, flow efficiency. Each of these aspects are usually handled by the corresponding expert team. These expert teams work only on their disciplines with minimal consideration of the other disciplines. This may result in large compromises in the other disciplines and also a need for constant synchronization of the designs. Merging the designs that each discipline decided upon and synchronization are resource consuming efforts that can be avoided through the use multi-disciplinary optimization. Multi-disciplinary optimization is an optimization methodology that incorporate all the disciplines involved. Models from each discipline is used under one study, each discipline possibly using a different simulation tool (solver). Models from these disciplines will have some shared design variables and these variables are linked to each other during the study. For a software tool to efficiently deal with multi-disciplinary studies, it needs to be able to communicate with many solvers. It also needs to have an intuitive user interface that facilitates the setup of such complex studies. HyperStudy’s open architecture allows easy integration of many solvers for multi-disciplinary design studies. HyperStudy’s direct integration with HyperMesh and MotionView enables direct parameterization of finite element, multi-body and fluid dynamics solver input data. 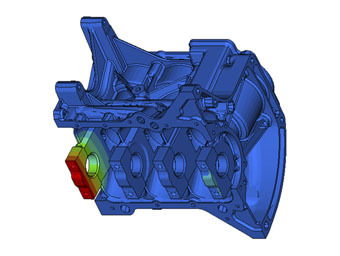 HyperStudy directly reads the results data of popular solvers such as OptiStruct, RADIOSS, AcuSolve, MotionSolve, FEKO, Abaqus, Ansys, Fluent, Star-CD, Nastran, Excel, etc. MMO provides a powerful approach to optimize multiple variants and configurations without much burden on the engineer. For efficiency in the run process, MMO is enabled through MPI parallelization. OptiStruct can use responses from different disciplines in the optimization process from analyses such as static, buckling, eigenvalue, frequency response, random response, thermo-mechanical, heat transfer, and acoustic. In addition to these, OptiStruct has innovative methods for system level optimization, and fatigue-based concept design and optimization. Typical structural analysis does not factor in the design and operating environment variations that occur commonly, and can cause deviations in expected product performance. Consideration of these deviations may become critical depending on the application. In cases where designs are optimized such that the design requirements are barely met, it is important for engineers to assess the design’s reliability and if necessary optimize considering the reliability requirement. A reliable design ensures that the design is safe even after deviations in its performance due to variations in the design and operating environment. In cases where variations in design and operating environment result in the design performance deviation greater than the allowable deviation, it is critical for engineers to search for a robust design. A robust design is one in which the performance deviation is within allowable limits. HyperStudy’s advanced optimization and stochastic capabilities help users to assess design reliability using sampling methods and achieve reliable and robust designs using enhanced Sequential Optimization and Reliability Analyses (SORA). Reliability and robustness assessment and optimization are computationally demanding studies. Both the sampling methods and SORA method, have been made efficient in HyperStudy using Altair’s proprietary sampling and optimization algorithms.